Bachelor of Electrical Engineering or Bachelor or Technology (Electrical). Applicants with Advanced Diploma in Electrical Engineering with extensive industrial experience may be considered. Manager Human Resources, Solomon Power, PO Box 6, HONIARA. 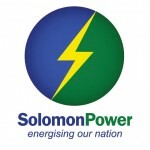 Solomon Power thanks all applicants for your interests, only those qualified will be screened and selected for an interview will be contacted. Tagio tumas.